General Eisenhower wanted to be in some of the pictures his soldiers were taking in liberated concentration camps. Here, he is at Ohrdruf with other high-ranking U.S. Army officers. They are witnessing a view of bodies of prisoners on the 12th of April, 1945. Online via the U.S. National Archives. WARNING: SOME OF THE LINKS IN THIS CHAPTER, PARTICULARLY THE VIDEO CLIPS, DEPICT GRAPHIC IMAGES OF WAR AND CRIMES AGAINST HUMANITY. PROCEED WITH CAUTION. 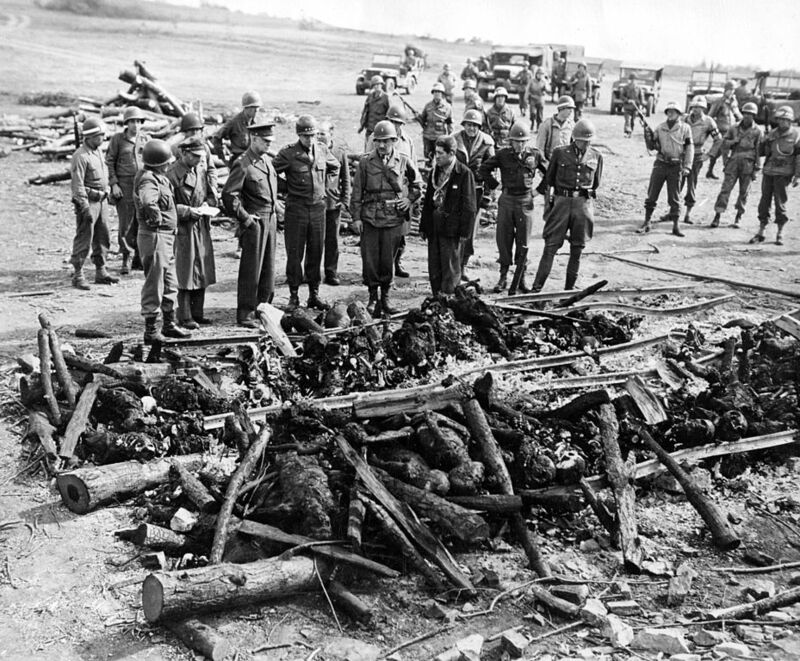 THE CLIPS ARE PROVIDED AS PRIMARY-SOURCE EVIDENCE OF NAZI ATROCITIES DURING WORLD WAR II. PLEASE PREVIEW ALL VIDEOS BEFORE ALLOWING CHILDREN TO SEE THEM. SOME ARE NOT SUITABLE FOR CHILDREN AT ALL. The U.S. National Archives contain a great deal of evidence regarding World War II. What do those archives reveal about the Holocaust? Bos, Carole "EISENHOWER'S PROOF" AwesomeStories.com. Mar 01, 2006. Apr 23, 2019.